Overwhelming Power and High Density Presence Achieved by 11.2-Channel Separate AV Amps The MX-A5000 discrete structured 11-channel power amplifier delivers powerful driving force that provides superb quality and performance for all channels. Combined with the CX-A5000 11.2-channel preamplifier, it achieves overwhelming silence and sound filled with dynamic feeling, the goal to which Yamaha constantly aspires. With all types of sound sources, you will enjoy a deep resonance that immerses you in music with the full scale presence of 11.2-channels. 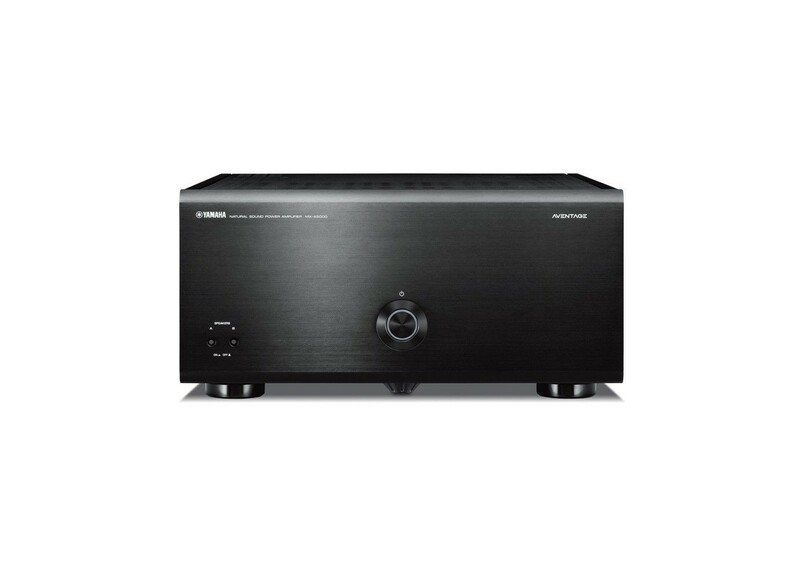 Specially Designed High Rigidity Chassis Eliminates the Effects of Vibration for Greater Sound Purity As part of the no-compromise design policy for this amplifier, Yamaha created an advanced chassis with strong rigidity. Chassis stiffness is enhanced by an H-shaped cross frame that boosts mechanical strength, by adopting aluminum side panels that increase the stiffness of the housing and by a three-ply structure with independent top cover and side panels. Any external vibration from the rack or other sources is damped by heavy insulators. The A.R.T. (Anti-Resonance Technology) Wedge in the center of the bottom cover acts as an additional vibration countermeasure and firmly supports the internal circuits and delicate parts. In addition, the MX-A5000 has a double bottom, consisting of vibration control plates made of 1/8 inch (1.6 mm) black steel, the same type of construction used on the previous flagship model Z11. In order to support the heavy heat sinks and other parts, it has a left-right independent construction strengthened by a rigid-frame structure. The bottom frame reduces the transmission of vibration produced by the large power supply transformer and heat sinks. It also incorporates a heavy insulator that blocks external vibration. Symmetrical Power Amplifier Layout This is just one of the many design details that all combine to create a superior receiver. The interior of the unit has been precisely planned, circuit-routed and built so that the left and right channels are physically and electrically isolated. This naturally maximizes channel separation, but also greatly improves signal to noise ratio and also helps to achieve a wide, open sound stage. Highest Quality Parts Achieve High Power to 11-Channels and Unrestricted Speaker Drive The MX-A5000 uses a current feedback power amp with a three stage Darlington circuit that has superior phase properties and is resistant to speaker impedance fluctuation. To fully realize its inherent power, it uses high quality parts with superior sound quality that were strictly selected based on listening tests. The power supply transformer is a specially developed high output, high efficiency, large size toroidal transformer. With two specially developed high capacity (27,000μF) block capacitors, it minimizes energy loss and features power supply capacity with generous headroom. This ensures sound capable of superior musical expression. The speaker output terminals are high quality gold-plated types and are compatible with Y plugs for optimum speaker connectivity. Noise Resistant, Highly Reliable Balanced Connection Electrical noise may be generated due to connection with other AV components and even to the connection between them, as well as from other sources of external noise. To ensure that the MX-A5000 and CX-A5000 are not affected by this distortion, balanced connections that are highly noise resistant were used, the same type generally used in pro audio equipment. Even the RCA unbalanced connection uses a ground sensing transmission method that achieves simple balanced transmission. And in cases such as that where each channel with the XLR is used selectively, the impact of noise flowing between the preamp and the chassis of the power amp is removed, minimizing sound quality deterioration due to the connection. In Addition to 11.2-Channel Output, 5-Channel Bi-Amping and Other Configurations Are Possible The MX-A5000 and CX-A5000 are designed to allow flexible system building. Complementing their 11-channel output that maximizes Cinema DSP HD3 performance and makes the most of the capabilities of the speakers, they also support bi-amping for driving tweeter and woofer with separate amps. Furthermore, they allow bi-amping of all five channels using the 11 internal channels. Extra amps can be used to power multiple zones in addition to the main room, letting you configure your system for music play in a bedroom or kitchen. On the MX-A5000, you can switch all 11-channel input jacks back and forth between balanced and unbalanced for each channel, further increasing system flexibility. Auto Power Standby Using less power saves money and is friendly to the earth. The MX-A5000 has an Auto Power Standby function that will turn the power off after eight hours. It can be turned on and off via a rear panel switch and will be overridden by the trigger function. Trigger Control for Synchronized Power On/Off The trigger function allows automatic power synchronization with other components that support this function. Connecting a preamp, for example, to the "Trigger In" jack turns the power on and off together with the preamp. Connecting another component such as a subwoofer to the "Trigger Out" jack syncs the power of that component to the MX-A5000. In addition, the input from the "Trigger In" jack can be output in a cascade connection to control the power of another component such as another power amplifier (Through Out). Speaker Impedance Selection The impedance selector on the rear panel of the MX-A5000 matches amplifier output current to various speaker impedances.